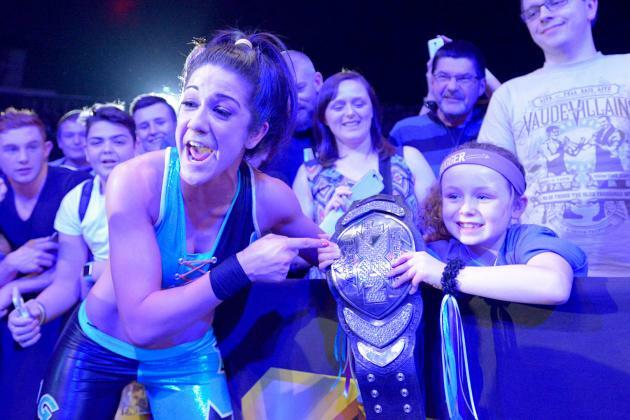 She's Fantastic: NXT Wrestling - BAYLEY! I've had this figure photographed forever but never got around to posting a review. I keep saying I'm going to stop buying WWE figures, (since I'm running out of room and I don't even watch wrestling after all), but then I see a figure that makes me cave in and I'm back in the habit. This Bayley figure got me because she is so weird. First of all, she has a side-ponytail. I never expected to see hair like this on an action figure. Then she has a headband with a cute little bow. Again, I never thought I'd see it. And finally, she has a cartoon triceratops on her pants. I am obsessed with the oddness of this. Bayley is a former NXT Women's Champion who is currently wrestling under the WWE's RAW brand. She has been wrestling professionally since 2008 with Big Time Wrestling and Shimmer Women Athletes. By 2012 she signed with WWE and began under NXT (WWE's developmental territory) before recently joining RAW in August 2016. Thank wikipedia for all that knowledge. Let's check out Bayley below! Seriously. Check out that triceratops.